On May 20, 2013, a major tornado ripped through the community of Moore, Oklahoma. Unfortunately the damage was just unthinkable. 24 people lost their lives. My heart grieves for those families. All of the money from the sale of these bundles goes directly to the speech-language pathologists affected by this disaster. 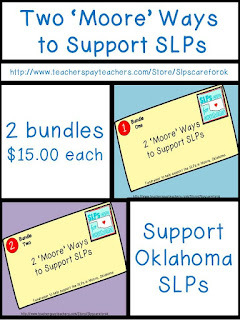 If you purchase either bundle, you will be helping a fellow SLP as well as snagging some awesome activities for yourself! I contributed to bundle #2. You can get my activity Semantic Fishbowl if you purchase bundle #2. This is great! I'm so excited! Thank you!